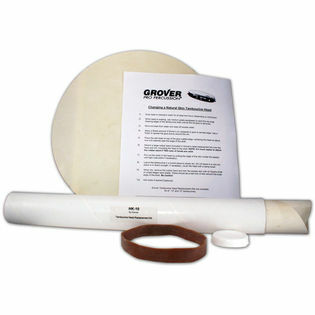 The Grover Tambourine Head Replacement Kit contains a premium skin head, special mounting band, and instructions. It has everything you need to re-head any tambourine (except glue). 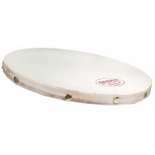 3 Kit sizes available, 8" 10" 12"
The Grover Tambourine Head Replacement Kit contains a premium skin head, special mounting band, and instructions. It has everything you need to re-head any tambourine (except glue). I broke the head on my favorite Grover tambourine rehearsing Trepak. I found this kit on the Steve Weiss website and ordered it. It came quickly and actually worked the way the instructions said it would. In fact, the replacement head is better than the original. One thing... Make sure you use the glue the instructions tell you. It actually matters! Two of my colleagues had the same observations about the rubber band needing an extra pair of hands. Here are two alternatives to using the large rubber band to secure the new head: 1) My brother combined two large hose clamps and used the extended circumference to hold the replacement head securely to the shell with no problems. 2) I used an embroidery hoop from a fabric/craft shop. Both methods work very well, you will have more control over the placing the head during the repair process and you will able to do the job alone. I re-headed my 30 year old Grover Tambourine, and it's good as new. Process was simple, the directions were clear. Used this product to replace the head on an early 1930's Ludwig Tambourine for a theater pipe organ. Worked perfectly! The kit is quite basic (just a massive rubberband, instructions and an flat/unformed replacement head) and it would probably work on any brand of tambourine that is similar in size. The instructions are clear enough, but you'll want an extra set of hands when it comes time to mount the head. could have been improved by providing replacement tacks (but thumb tacks work fine). Also ours ended up a little bit high tuned for my taste- so I might not stretch it quite so much next time around.